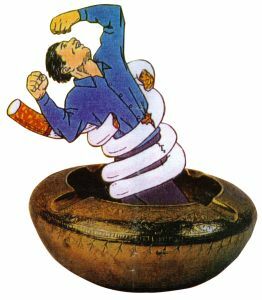 Sir Ganga Ram Tobacco Cessation Centre is a specialized service wherein people who are habituated or addicted to smoking/tobacco chewing, are given assistance and support to quit their tobacco habit. This is perhaps the first hospital in India, to provide a detailed program for treatment of tobacco dependence. We provide a Structured Tobacco program wherein we help the smokers/tobacco habitués quit their addictions effectively, and also maintain long-term and even permanent abstinence. Ask a confirmed smoker if he or she enjoys smoking and chances are the answer will be "yes." Ask the same person if he or she would like to quit. You'll probably get the same answer— "yes". Researches say that seven out of every ten smokers want to quit the habit, but cannot because nicotine is as addictive as cocaine or heroin. Tobacco products are highly addictive. Nicotine dependence makes quitting smoking difficult; and most quit attempts fail without treatment, 97% of quit attempts end in failure. We understand your addiction; and can help you in your quitting attempt. The program provides a stepped care intervention to help people quit tobacco. There is a provision of a range of different intensity interventions, which are applied in response to the needs of the smoker. The program involves multiple counseling sessions to help smokers change their behaviour and provide step-by-step assistance during the quit attempt. a. We provide a Structured Tobacco Cessation Program, specially designed for every smoker. It is a highly individualized program, in which every smoker/tobacco habitué is provided with intensive psychotherapeutic interventions, along with pharmacotherapy (medicines) to substantially reduce the withdrawals/urges of quitting. We make every effort to make the quitting process easy and less discomforting. c. The treatment involves a detailed assessment procedure that also includes psychometric testing and physiological testing. We have a Smoke check machine, by which we assess the CO levels in smokers. d. We provide a series of intensive counseling sessions to give step-by-step assistance during the quit attempt. The psychotherapeutic interventions usually include motivation enhancement therapy, cognitive behaviour therapy, adaptive coping skills training, and relapse prevention training. e. The pharmacotherapeutic intervention includes medicines to help control the urges/withdrawals; and to make the quitting easier. We use a combination of various therapies to help control the withdrawals and unpleasantness while quitting smoking. We also teach yogic exercises to help smokers expel toxins and revive their lungs. With our sustained efforts; and intensive intervention module, we could achieve a quit success rate of 80% over a period of three months follow up. We strive to make the world a "Tobacco Free World"